It’s time for another homemade pizza recipe. 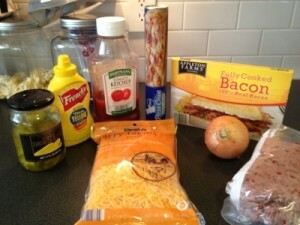 I decided to combine two of my favorites, bacon cheeseburgers and pizza, and see how it would work out. We start by cooking our ground beef just to the point where it is no longer pink (it will cook further in the oven). Add any spices that you normally add to your cheeseburgers. I add a little onion powder, garlic powder and Worcestershire sauce. Drain and let cool. We then prebake our dough at 425 for 6 minutes. Then we use our ketchup and mustard to make a “sauce”. We add a thin layer of cheese. spread the hamburger topping around ensuring good coverage. Then add bacon pieces, again ensuring every bite gets a piece. 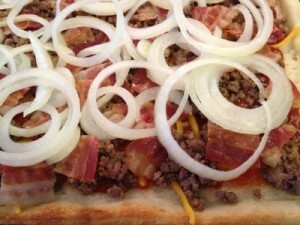 Then spread around the onions and top with another layer of cheese. Then back into the oven for another 6-10 minutes to let it all melt together. The final result! We start by cooking our ground beef just to the point where it is no longer pink (it will cook further in the oven). Add any spices that you normally add to your cheeseburgers. I add a little onion powder, garlic powder and Worcestershire sauce. We then prebake our dough at 425 for 6 minutes. Then we use our ketchup and mustard to make a “sauce”. We add a thin layer of cheese. Spread the hamburger topping around ensuring good coverage. Then add bacon pieces, again ensuring every bite gets a piece. 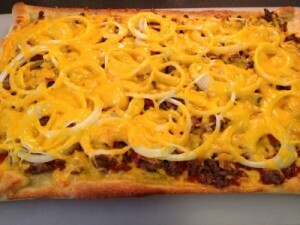 Then spread around the onions and top with another layer of cheese. Then back into the oven for another 6-10 minutes to let it all melt together. This recipe was soooooo good. I had to put a meal together tonight using only what I had on hand. I had some frozen, precooked ground beef in the freezer and I was trying to think of something to use it in. I open the refrigerator and see the pizza crust, and I always have cheese on hand. I started to think, hmmm. 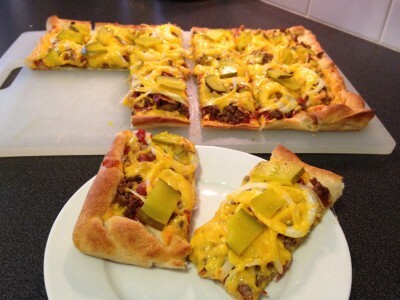 I went to Pinterest and searched Cheeseburger pizza and came across your post. Delish! It is certainly a keeper. Hi Brenda! I am so glad you gave it a try. We have not made this one in quite some time. My hubby received in a new Pizza Oven Gadget for Christmas, I think we will have to make this one up this week for Pizza Night. Whenever I mention this pizza to others they seem immediately have a weird look on their faces but wow, we love it!